Humans are creative in so many ways, but we're not the only ones. Did you know animals are creative too? The bowerbird is an interior decorator. Watch how he uses color and design to attract a mate. 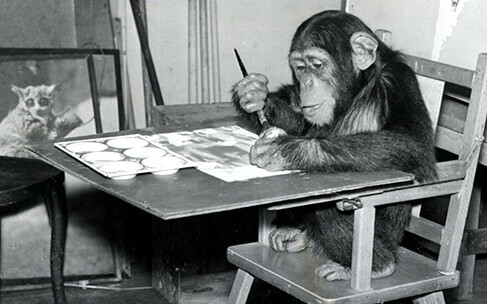 Congo was one of the first chimpanzee artists. Here's a mini-documentary that shows Congo painting. The bird of paradise is a dancer. Watch him put the moves on an unimpressed female. Ravens use tools to solve problems. This raven solves a puzzle that would baffle a toddler. Humpback whales are the jazz singers of the sea. Nobody knows why they sing, but everyone can enjoy the concert. You know sea otters use rocks to crack open clams. But did you know river otters like to juggle? Barnacle goslings invented base jumping long before we did. Watch this little guy plunge over 400 feet (don't worry, he lives). Like many birds, sociable weavers are amazing architects. Look at these high-rise condos they designed. If you know of other creative animals, let me know so I can feature them here!